In this delightful December 15 1906 episode of Zoo Zoo Herriman gives his cat the unequivocal starring role for the only time in the short series. If you're scratching your head over the final panel read about Comstock Laws here on Wiki. For the next four days Herriman is relegated to providing only spot illos. On the 20th he has a sports page cartoon commemorating a 50 to 1 longshot coming in at the Ascot race track, and another episode of Zoo Zoo which will have to wait for next Saturday. Alfredo Castelli, Italian comics icon and cartooning history scholar, has been researching and writing his magnum opus, Here We Are Again, for the past decade. 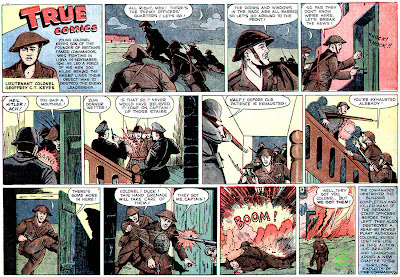 The work, which recounts the history of American comic strips in their formative period (up to 1919), was released with Italian text last year and an English translation is in the works. In a strategy that has some fellow authors aghast Castelli recently announced that anyone who would like a copy of the Italian edition (text in Italian but the voluminous illustrations in their native English), which retails for about $300 US, may download it in PDF form for free. Castelli characterized the offer as "a late Christmas present" to comics fans. Fellow researcher Allan Holtz, who contributed data to the book, said Here We Are Again "is absolutely the greatest contribution to the scholarship on American comic strip history yet published." Regarding the giveaway Holtz commented that "Castelli has obviously spent far too much time breathing old newspaper fumes. Mad as a hatter, I'm afraid. He has been struck down by an affliction that all comic strip researchers dread. Every time you open a newspaper bound volume you can feel the brain cells dying. It's a wonderful but highly addictive and harmful aroma." Castelli says that the offer will expire on February 7 and the PDFs will no longer be available after that date. Is it madness, though? The zip files give you the text, though in Italian, and an indication of what these thousands of illustrations look like, though the resolution is such that you can't really see them that well. It has all really whetted my appetite for this book: full size, discernable pictures and in English. Brilliant promotion, in my opinion. Is the book n sale yet? pubblicata sul fumetto americano in syndication”, “The most important reference work ever conceived on American syndicated comics”. A short entry dedicated to Stripper’s Guide Blog is at page 704, Col 1. Please download the book’s frint and back endpapers, where Allan’s very important contribution to “Eccoci ancora qui!” is credited. ah, that was you. It all goes past in a blur. But I must say that my wife and I enjoyed the dinner very much (My mother-in-law was of Italian descent), and don't recall the place being too messy at all. and to Allan, I had a little trouble with Blogger myself today, but it came right. Am missing my shot of Zoozoo. Can You ID These Artists? I'm trying to get my index listing for the True Comics Sunday series as buttoned up as possible. Problem is that many of the toonists who contributed pages (and there were quite a few) didn't sign their work. I do know, or at least strongly suspect, that all these artists were primarily in the comic book field -- all the ones who signed were, anyway. I know Sam Glankoff did lots of the Sundays, with additional contributions by Ed Smalle, Lew Glanz and Chad Grothkopf and others. I know some of you folks are also comic book fans and researchers, so I'm hoping you can ID some of these guys. Here are four samples from 1942. The first is a guy who did quite a few pages in 1941-42. The style is quite unique -- the faces, I think, are a dead giveaway to the artist, but who is it? Okay, that's four mystery artists. If anyone has definite ideas on the IDs please let me know. If you'd give me some idea of your certainty (50%? 75%? 99%?) that would be helpful. All I know is Joe Simon is supposed to have done them in 1944, so I hope you will continue these into that area. I am no help on these, though. I used to know Ed Smalle's art real well - but it's been a couple years since I was certain of his style - so I wont guess yet. (but its possibly the first guy, less likely the second) His father was quite a singer though. Sorry, didn't make myself clear. Glanz, Smalle et al did sign their work. The Sundays shown here are by other artists who did not sign their work. And I was saving up Joe Simon as a surprise -- we'll get to him in a subsequent post. Other than those already mentioned I have Jack Sparling and John Spranger listed as contributing artists. Jerry Bails' Who's Who has Harry Lucey doing two weeks in 1942. I don't know if the above did Sundays or Dailies or both, or if that is their art on any of your samples. Wasn't Elliot Caplin the editor of this series? The first one is by Lloyd Ostendorf a regular on Treasure Chest comics from Dayton, Ohio in the sixties and seventies. 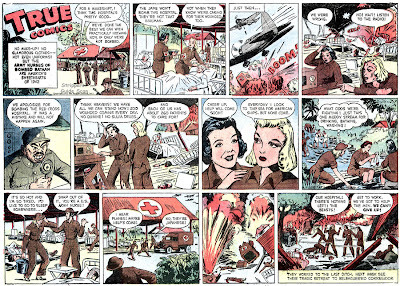 The second is probably Lou Fine who was doing a lot of advertising comic work at the time. Oops, Lou Fine is third. Third I say. I don't know much about this series but it must have been produced by Johnstone and Cushing who handled the comic section in Boys Life and probably Treasure Chest as well. I'm 100% sure of the identification of Ostendorf and Fine. Re Lloyd Ostendorf, can you suggest somewhere I might see some of his comic book work? All I could find so far is a site with some later work, and it didn't have any of the style cues I'm seeing here. See my blogpost today on Yesterday's Papers. 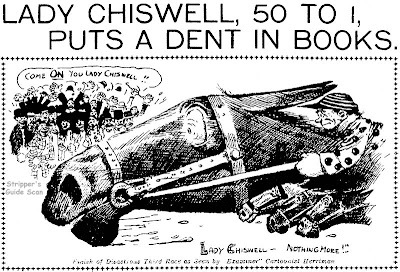 There is a link there to Treasure Chest digital archive with lots o' Lloyd. I checked the Treasure Chest site (wow - what an achievement by the way!) and the only Ostendorf stories they referenced were from 1962-63. In these I could see no trace of the style of mystery artist #1. Of course an artist's style could well have evolved a long way in 20 years. Anything earlier you can suggest? OK, here's a good one from 1952,"Outdoors With Dan" about boy's author Dan Beard, on the Treasure Chest site. Vol. 7, No. 9, January 3, 1952 page 10-13. His line is tighter and his skill in drawing expressive faces and hands is much in evidence. A quick link is to look under B for Beard under the main heading People. Funny someone would suggest Lou Fine for the third, for I would have guessed one of the artists mimicking Fine aorund the same time... which would be either Alex Kotzky or Jack Spranger (or I believe it's Jack, anyway). You could be right- if so its a dead swipe of Lou Fine. Checked out that 1952 story, I still see no resemblance in the distinctive faces which are my main point of reference on the 1942 mystery artist. 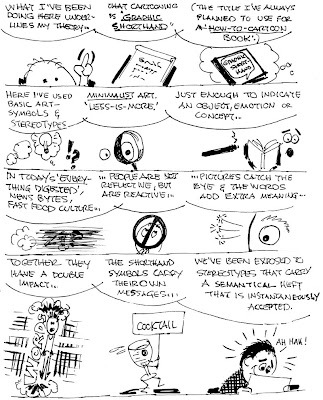 Again, artists do get better in ten years, so I'm certainly not ruling it out. 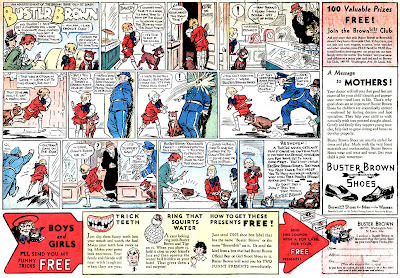 I'm guessing this constitutes Buster Brown's last appearance, in strip form at least, in the Sunday comics. This 1934 ad campaign for Buster Brown Shoes doesn't seem to have gone on very long; at least this is the only sample I can recollect seeing. 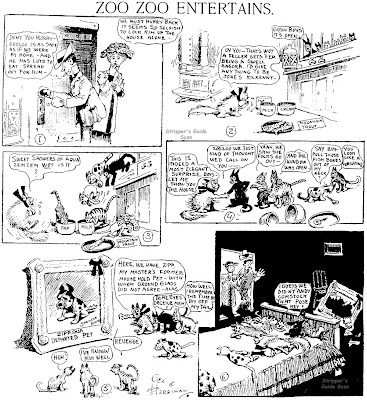 This Buster strip is penned by the great cartoonist of the Betty Sunday page, C.A. Voight. The work isn't signed but Voight's style is distinctive enough to make it an easy call. Hello, Allan-----I think this Buster Brown ad was a one-shot, as I never saw another, either. 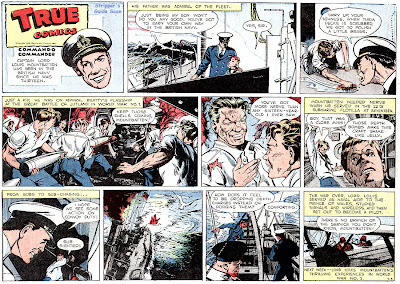 Voight did several early ad strips, as well, for (I think) Rinso detergent. Other retired strip characters that made their last appearance as shills include Dumb Dora,(Wheaties, ca. 1940, by Paul Fung) the Joys and Glooms,(Pepto-Bismol, 1938) Doings of the Duffs,(Jell-o, 1934, by Ben Batsford) and the Yellow Kid. (Ready-made fill-in the blanks series of ads, ca. 1910, by Outcault.) ---Cole Johnson. Hi Allan and Cole. No, it was NOT an one shot. Take a look at "Eccoci Ancora Qui" (I have sent the links for downloading the whole 704 page book to PlatinumAgeComics and Comic Strip Classics; see posts "Late Xmas Present from Alfredo Castelli") and you'll find a different sample at page 191 (book 03). Am I understanding you correctly that you wish me to publish the links to the downloadable book here on the blog? If so I will be happy to do so. I think anyone that visits this blog would be thrilled to have access to it, but I assumed you wanted to restrict access to the CSC group. LINKS to "HERE WE ARE AGAIN!" Sure, if you think that "Eccoci ancora qui" may be of interest to the readers of "Stripper's Guide", I'll be very happy if you publish the links to download it. The book is copmplete, 704 pages, in Italian but with about 5,000 (Five thousand!) illustrations. 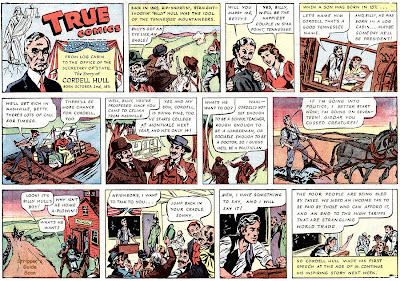 Here is all the listings for True Comics in Jerry Bails' Who's Who (http://www.bailsprojects.com/). Hopefully it may give some hints. Here's one I was ambivalent about finding. 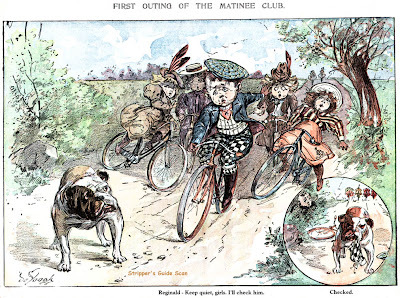 The Matinee Club ran twice in the New York Herald on 7/10 and 7/17/1898. The feature ran on the back page of the Herald's Sunday magazine section, not on the comics pages. Ken Barker's excellent Herald index doesn't list this feature so I assume he wasn't checking this section of the paper when he was going through the microfilm. That means the Herald needs to be given a second indexing by me to catch these additional items. The De Yongh who signed these Sunday panels is probably John de Yongh (1856-1917). A quick Google search finds that he was responsible for a line of humorous postcards in the late oughts, and drew portraits and advertising matter as well. By the way for the purposes of full disclosure I did replace the original lettering at the bottom of the panel. For some reason though the panel is given half page play the type at the bottom was set in tiny little agate type. Go figure.